Your friend just graduated from college with a BS in Applied Behavioral Analysis (ABA). She’s excited to start working at the local clinic downtown helping kids with autism. What you’ve learned from her has given you a great respect for the science of ABA and has piqued your interest in the field. You’ve even considered switching your major. You love helping people, but the problem is, you aren’t particularly enthusiastic about working indoors. You’re more of the outdoorsy type. You love nature, hikes in the woods… and you’re a total dog nerd. One of the misconceptions about ABA is that it’s only for people with behavioral issues. While that may be one of the more common applications, it isn’t the only one. Believe it or not, if you’re a dog lover, ABA could be just the career path for you. No, you don’t even need to be some kind of dog whisperer like Cesar Milan, just a patient practitioner with a strong understanding of how behavior analysis is applied. ABA has been used for decades to train dogs to carry out really important work for their humans. Historically, people have kept dogs as workers, not just companions. The Komondor for instance, has been an important protector of sheep and other livestock in Hungary. Looking much like a wooly ball of fur, this dreadlock clad dog easily blends in with the flock and can surprise any would-be-attacker… In the late 1800s Germany also bred dogs to take care of sheep. The German Shepard didn’t blend in like the Komondor, but stood out as a sign of strength and protection against wolves and other threats to the flock…The Saint Bernard is known for its heroic rescue work as far back as 1690. These dogs were kept at the Saint Bernard monastery in the City of Aosta, Switzerland. They were trained as guards of the monastery as well as rescue animals looking for lost travelers in the snow covered Alpine passes. Of course a person can’t just go to a local shelter, pick out a dog, and expect it to perform. A dog needs to have certain inherent – or bred – characteristics, but even that alone isn’t enough. They also need lots and lots of training. That’s where you come in. The more you expect from your dog, the more training it will need. And bonus! Dogs are great clients and can be a lot of fun to work with. In the past, animals were trained primarily with negative reinforcement. This meant a dog would get smacked, choked with a chain, or intimidated by some other use of force in order to modify its behaviors. About three decades ago, a book came out that changed all that: Don’t Shoot the Dog, by Karen Pryor. It was originally intended as a discussion of human behavior and relationships. It didn’t do very well in that arena, but because it had dog in the title, it became popular with dog handlers and ended up being so influential that it forever changed training methods. Now most trainers use the ABA methodology as a matter of course. And dog training goes far beyond helping someone have a well-behaved fuzzy family member. Today dogs are used in law enforcement, TV, forensics, mine detection, sniffing out dangerous molds in buildings, and as therapy and service dogs. They can even alert you to certain medical issues such as impending seizures, and they’ve even proven adept at detecting cancer. This is just a small fraction of scenarios for you to consider. If you want to work in ABA and love working with animals, being outdoors, and also enjoy the rewards of knowing you helped someone, it may be time to switch your major. The work that you do with dogs can be life-changing and life saving. In fact, you and your friend may eventually team up. Therapy dogs and autism often go hand in hand. Many parents have asked, “What can a service dog do for a child with autism (ASD)?” The short answer? A service dog might not be the right choice for a child with ASD. There are actually three levels of dog training to consider when choosing a dog for a person with ASD (or any other medical, emotional, or physical need): A service dog, a therapy dog, or a companion dog. A companion and emotional support dog receives the kind of training that basically makes them a very well-trained pet. These dogs are often recommended for children with autism. They allow a child to have a constant companion they can love unconditionally, plus it provides an opportunity for skill building and responsibility as they handle all the things involved in caring for a pet. Therapy dog training teaches the same kind of behaviors as a companion dog, but the dog will often times be involved in a client’s therapy session, whether it’s occupational, PT, or some other form of therapy. 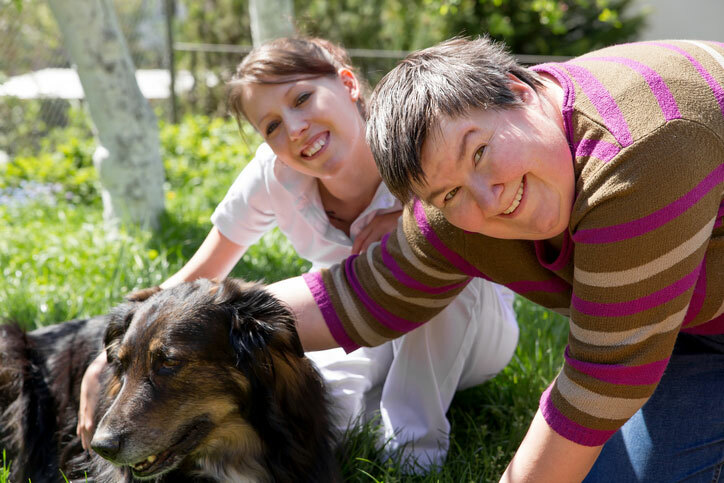 The dog is there to help calm and comfort patients, which is often trained to work with a specific type of patient in a specific clinical setting. The best trained therapy dogs are registered with Assistance Dogs International. Service dogs are usually for those who need some form of assistance such as a guide dog for the blind. In the case of autism, a service dog can legally accompany a person in all public places, including airlines, buses, and malls. They intervene and act as a calming presence in stressful situations.